You can never have too much Ryan Gosling – especially on the international day of love! The Oscar nominee has been breaking hearts to packed houses in Damien Chazelle’s La La Land and the good folk at The Light House Cinema couldn’t think of more charming company with whom to spend Valentine’s Day. Head to The Light House Cinema in Smithfield for a full day of Gosling films plus a special Ryan & Wine menu featuring delicious red velvet cupcakes, wine and cocktails specials which you can enjoy in the bar and in-screen. This is definitely worth taking a half day for! Oscar frontrunner and audience favourite La La Land sees the lovely Ryan singing, dancing and tinkling the ivories all while dressed in sharp suits and tap shoes. What more could you want? This old-fashioned screwball rom-rom is as charming as they come and perfectly captures the messy world of love in modern times. Oh how we love a reformed bad boy and Gosling ticks all of our boxes as cocky charmer Jacob, who takes newly single Steve Carrell under his wing. Ryan Gosling earned his place in our hearts in this classic (it can be called a classic by now, right?) weepie about the journey of two soulmates as their rocky road to true loves unfolds over an entire lifetime. Kissing in the rain has never been sexier! No, YOU need a tissue! So we don’t get bogged down in sentimentality, let’s not forget where we all REALLY fell for Ryan Gosling. No mere mortal could pull off that iconic silver jacket with quite that level of swagger, nonetheless woo us with his silent, dead-eyed killer routine. Gosling hammered all of our hearts in this electro neon fever dream from Nicolas Winding Refn. 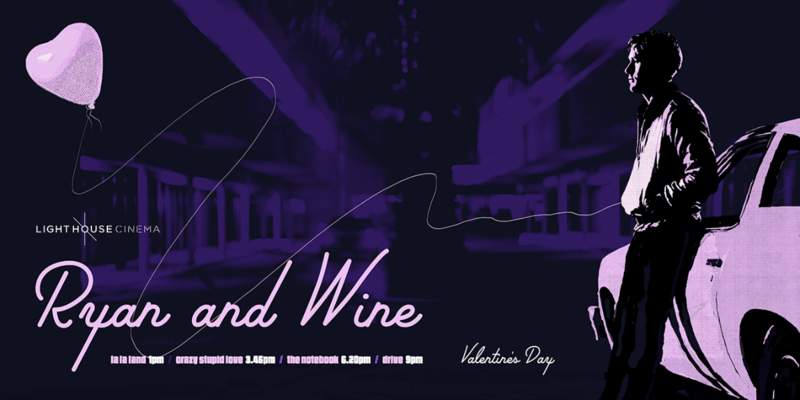 Tickets and a full list of the Valentine’s Day Programme can be found here.